If you're anything like me, when a new set is coming out you probably pour over spoilers, watch/listen/read set reviews, and get in a few games of sealed at prerelease. While all these activities certainly help with drafting, and having a general understanding of what cards are good in the set, there's just something about looking at 14 fresh cards that a little daunting. What commons do you take over uncommons and rares? Does Shock, or insert damage amount here, trade up? What's the worst color? What's the pick? Discuss in comments. 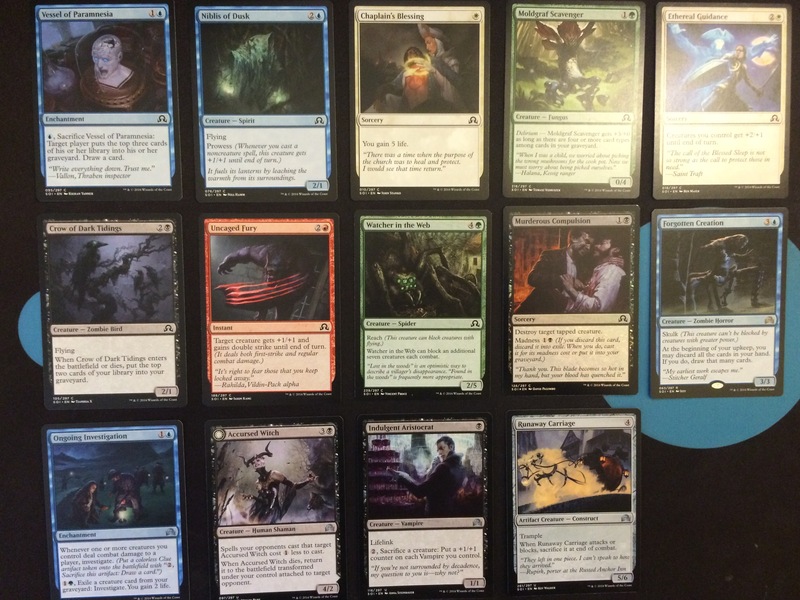 On Wednesday we were able to pool enough packs together to fire a draft. With my group we use a simple keep what you open system, usually snap a picture, so no one needs to rare draft. Or if we're missing a few folks, team draft where the winning team splits all the cards opened. They are both great methods for encourage folks to draft "real" decks. I Pack 1 Pick 1'ed an Elusive Tormentor followed up with a Bound by Moonsilver. White dried up almost instantly, and I snagged a pair of Solitary Hunters and some middling green cards in the rest of Pack 1. 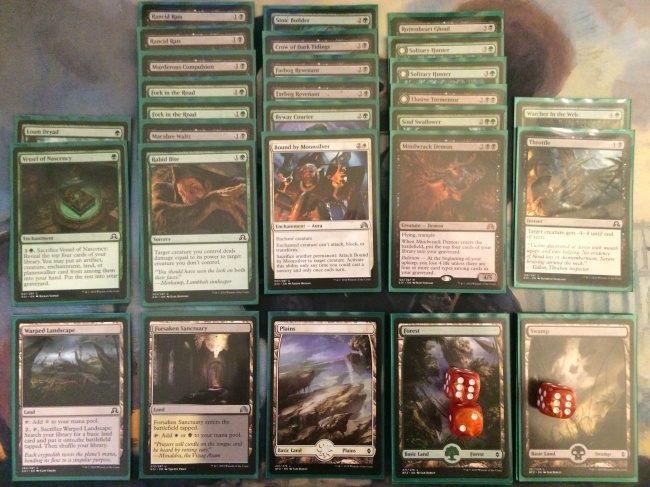 In Pack 2, I got passed the Mindwrack Demon from the left and solidified in Green/Black with some Rancid Rats and Rabid Bite. The final pack I prioritized removal, scooped up a Soul Swallower along the way, and kept my splash open with some land picks. One take away that we all had was that each color has a lot of depth for multiple drafters. While everyone in green fights over Rabid Bite, not every green player wants say Moldgraf Scavenger. We had multiple seats where players sitting next too each other were in the same colors, and because the synergy of the set is so high their decks were not bad either. For instance, one Red drafter was looking for werewolves while another was taking Madness cards and vampires. After taking the first few powerful first pick quality cards you're going to want to settle into a niche. An interesting and noteworthy aspects of creatures in Shadows over Innistrad is that they tend to be on the small side, until suddenly they are huge. Green and Red both gets some impressively sized common werewolves in Gatstaf Arsonists and Solitary Hunter, but otherwise ground combat gets especially clogged up quickly with all the high toughness creatures. Even the flyers and skulk creatures often bounce off each other, also Watcher in the Web is a big wall of nope to anyone attacking you. I'm not sure how much sealed will translate over to draft, but there were a lot of unintentional draws. Be sure to play quickly or even consider conceding when needed to have a better chance in the next game. Synergy is through the roof though, especially in the uncommon slot. A few highlights: pitching a Malevolent Whispers to a Lightning Axe inside combat and assembling Indulgent Aristocrat and Call the Bloodline. While it's still possible to get there with a generic good stuff deck, most Shadows over Innistrad draft decks will be able to beat that. These synergistic decks can easily blow through or invalidate even the best and most powerful rares, if they draw the right cards in the right order. A few final thoughts on mechanics. If you're interested in turning on Delirium, it generally means dedicating some slots to it. Creatures, instants, and sorceries end up in the graveyard easily enough, but the rest generally take some help. Sometimes that's just taking and trading with some artifact creatures, but most of the enchantment enablers are better than they look as well and there are a fair number of sacrifice or discard outlets when you're in a pinch. Speaking of discard, most of the Madness spells are costed that they are still decent without it, but enablers mean that many are extremely cheap or sometimes get added benefit. Even something as middling as can be really great in the right deck. Finally, the first several clues from Investigate are great, you'll usually find spots to throw some extra mana into drawing a card. However, you're only going to be able to crack so many over the course of a game and not fall too far behind. See also, Investigate doesn't make bad spells that much better. Good luck in everyone's first drafts tonight!